Love the sight of freshly fallen leaves? Bring the beauty of autumn to your tabletops with these maple leaf place card holders. They're wonderfully practical decorations for any fall-themed wedding, engagement party or Thanksgiving celebration. 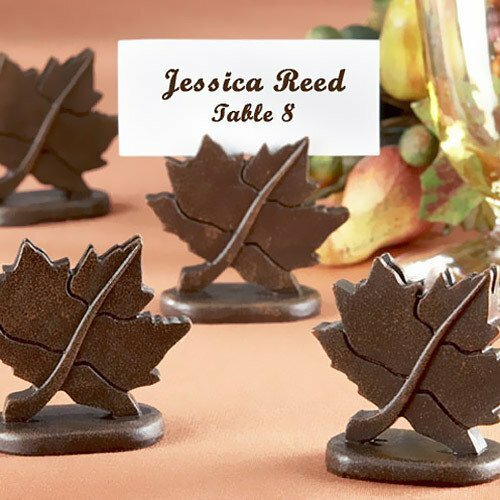 Each mahogany-colored resin place card holder is shaped like a maple leaf complete with realistic texture and detailing. Simply slip a place card in each and you're ready for the big day (place cards not included). Measures approximately 2" x 2". Sold in sets of four. You'll also fall in love with our maple leaf favor boxes, fall leaf soap favors and personalized fall cookies.